Scrophularia is a perennial herb that is commonly found in North America, western and central Asia, and Europe. The plant is characterized by its smooth, square-shaped erect stems and oval, dark green leaves. 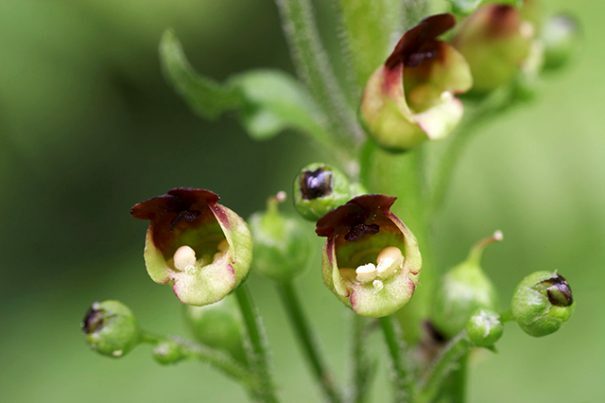 The flowers of the scrophularia plant are green tinged with red-brown upper lips and small sepals. The stems and the leaves are the commonly used parts of the plant, which is harvested in July. The plant possesses a bitter taste and unpleasant odor. An article posted on the Tip Disease website notes that scrophularia comes in other names such as figwort, rosenoble, throatwort, and carpenter’s square. Scrophularia works well with other medicinal herbs such as anemarrhena, agrimonia pilosa, and atrctylodes lancea. Scrophularia is traditionally used as a remedy to scrofula, a type of tuberculosis infection that affects the lymph nodes in the neck. The plant is also touted for its detoxifying properties that effectively cleanse the blood and eliminate toxic substances from the body. According to an Herbs 2000 article, these detoxifying effects make the plant a potent treatment against chronic skin disorders. Taking the herb internally or using it as a topical remedy is found to alleviate psoriasis and eczema. Likewise, using the plant as a topical treatment is shown to accelerate wound healing and relieve burn injuries, ulcers, gangrene, and hemorrhoids. Scrophularia addresses the diseases caused by ringworm, tender swellings, piles, and skin eruptions as well. The herb is beneficial to the bones and joints too. An article on the Medicinal Herbals website notes that the plant contains gentle laxative properties that promote uric acid excretion and relieve joint pains. Scrophularia is also traditionally added to baths to address foot aches and rheumatism. The plant also possesses mild diuretic effect for maintaining a healthy urinary system. The mild laxative properties in scrophularia is shown to ease constipation as well. Taking the herb as a syrup or infusion is also found address various diseases of the liver. A decoction made from the plant’s roots may also alleviate tonsillitis, swollen glands, and deep-rooted abscesses. Likewise, the herb can be used to eliminate parasitic worms from the digestive tract. In addition, scrophularia is touted to address weak blood, poor lymphatic circulation, mastitis, and distended lymph nodes. The plant is also found to promote women’s health. The herb is traditionally used to ease menstrual pain and replenish lochial or vaginal discharge following childbirth. Scrophularia is best known for its detoxifying properties that cleanse the blood and rid the skin of various disorders. The herb is a powerful aid for the bones and joints too. In addition, the plant helps maintain a healthy digestive tract and enhance the urinary system. Scrophularia is also known to fortify the lymph nodes and improve women’s overall health. The leaves and stems of scrophularia are traditionally dried for use in liquid extracts, tinctures, and ointment. The roots can also be made into decoctions that alleviate throat problems. Likewise, the leaves can be brewed as tea to relieve various health woes. The plant is commonly mixed with purple coneflower, lemon balm, or peppermint in making an herbal tea. An article on the Herbs for Life website provides a step-by-step guide in making scrophularia tea. Scrophularia relieves various skin diseases such as eczema, psoriasis, and gangrene. Scrophularia alleviates joint pain, rheumatism, and digestive conditions. Scrophularia addresses menstrual pains and diseases of the lymph nodes. Scrophularia is beneficial to the skin, bone, and joints. Scrophularia supports both the digestive and the urinary systems. Scrophularia improves lymphatic profile and women’s overall health.